Surprised my wife with this old curio cabinet Saturday. She’s been eyeballing it in one of the local shops for a while, but then would eyeball the price tag and sigh. But…they were having a sale and even then, I sighed a bit as I wrote the check…but it’s only money and I’ll make more. 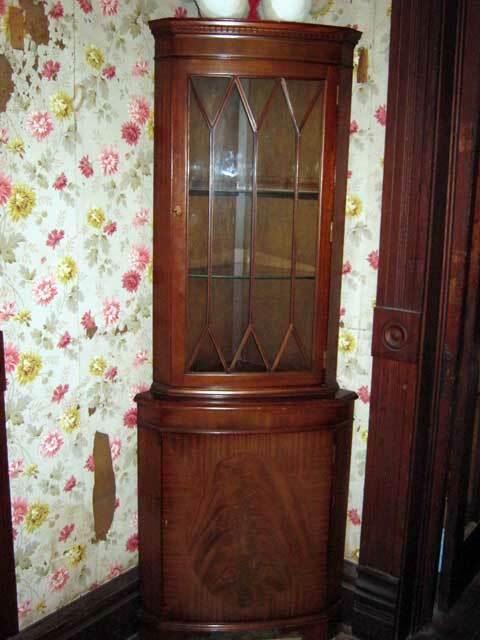 The cabinet is old, and it’s dainty, and it fits very nicely in the corner of our dining room…which is an interesting place as it’s a room that only has one (90 degree) corner! The cabinet is a little over 6 feet tall. I’m not sure how old the cabinet is…given its construction details and the oxidation on the bottom/backs I would guess it’s early 1900’s. It looks great in our room though and actually matches the trim on a large china hutch we purchased as well (not an antique, but a nice style for our room). 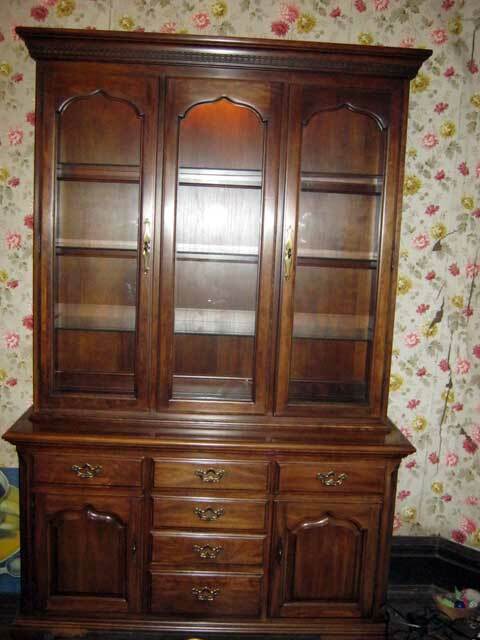 The hutch is a large Thomasville piece of excellent quality and solid construction. We paid very little for this piece as it was packaged with an antique table we purchased to fill this 27 foot deep dining room! Pictures of the table will come later. Very old, sturdy…drop leaves on both ends…3 leaves for the middle…well over 12′ long…it will be great in this room. And yes, the wallpaper is slated for an upgrade…it’s getting kind of ratty…what with the fading of any green/blue and the tearing…they just don’t make it like the used to I suppose…it’s only 110+ years old! So…yep. This was a furniture moving weekend!